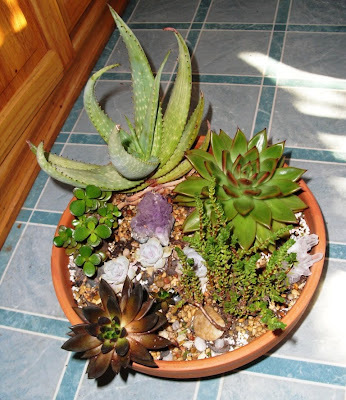 As I mentioned in my Haworthia bowl post, mixed succulent plantings can be tricky. Subtle or not-so-subtle differences in preferred conditions among various plants can cause them to languish when planted together. Clockwise from the top left: Aloe gariepensis; an Echeveria agavoides cultivar; Crassula mucosa; Echeveria 'Black Knight'; Echeveria 'Lola' (three of them); Crassula ovata. The Crassula ovata was originally larger; I cut the taller part of the plant off and let the newer branches at the base remain. There was originally a Crassula lycopodiodes in the spot now taken by the Crassula mucosa. The C. lycopodiodes grew too large and dominated the bowl. The original rosette of E. 'Black Knight' is looking a trifle haggard, but there are two healthy offsets at its base ready to take over if I need to cut it back. So all and all this planting seems to be sustaining itself nicely. I guess I could grow to like Echeveria... trying to decide whether it's lucky or unlucky that I don't have enough room or enough light for them.